Each year, we bring together colleagues from Affiliate organizations across the U.S., Puerto Rico, and Panama. This year we’re opening our conference to our Smithsonian colleagues from our 19 museums, various research and cultural centers, libraries, and the National Zoo to not only lead sessions, but to also attend the conference for their own professional development. Over four days of insightful programming and networking, colleagues at all career levels and in diverse roles will gather for workshops, behind-the-scenes tours, sessions, evening events, and networking opportunities. We’ll be tackling topics such as women’s history, climate change, digital tools and technologies, leveraging your Smithsonian partnership and creating communities of engagement. 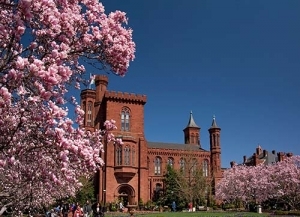 The Conference provides unique access to Smithsonian experts, program and exhibition possibilities, and collaborative brainstorming with fellow colleagues in the Smithsonian Affiliate network. How can we connect our audiences to the wonders of the universe? Discover the benefits of NASA’s Universe of Learning (NUoL), a partnership among Smithsonian Affiliations, Smithsonian Astrophysical Observatory, and a network of NASA scientists and educators dedicated to developing multidisciplinary ways to access astronomy content. NUoL has developed a suite of astronomy exploration resources: images, visualizations, hands-on activities, exhibits, and digital interactives. In this hands-on workshop, three diverse Affiliate organizations will share their experiences adapting these resources to meet the needs of their local audiences. Then, participants will have opportunities to explore immersive virtual reality environments, control robotic telescopes to scan the skies, manipulate images of galaxies and nebulae, and devise ways to take these experiences home to their audiences. The goal is to learn how participants can adapt NASA resources in innovative ways to their own local context to better advance scientific literacy. Finally, you’ll be able to find out how you can apply in August 2019 to receive implementation funds to create your own NASA’s Universe of Learning program! The 50th anniversary of the first Earth Day is in 2020. Building on the successes of the original Earth Optimism symposium in 2017, the Smithsonian Conservation Commons and its partners will convene and facilitate Earth Optimism live events and digital story-platform building collaborations. Together, the goal is to unlock and amplify the power of these real-life “hope-tales” on local, regional and global scales. This two-hour workshop will provide a unique opportunity for consolidated in-person exploration, between Affiliates and several Earth Optimism team members, of the collaborative opportunities for Earth Optimism 2020. What does it mean to prototype? What impact does it have and how do you measure success? Through the invention process used in Spark!Lab in the National Museum of American History and network sites in museums across the country such as the U.S. Space and Rocket Center, this session will introduce how to adapt content to a variety of museum settings and audiences. Hear from Spark!Lab and Affiliate staff on how they test and evaluate new prototypes with stakeholders. Participants will create a prototype based on their organization’s content, and gather feedback from session leaders and other attendees. Open to all Smithsonian attendees and Affiliate attendees. Come to this session and discover something new about your fellow Affiliate and Smithsonian colleagues. Share your experiences of working with each other, or learn ways you can begin working together. Smithsonian Affiliations staff will be on hand to answer questions and elaborate on all the ways we connect. As the first woman to lead the National Air and Space Museum, Ellen Stofan is no stranger to leading change in an organization. She served as NASA’s chief scientist, developed plans to bring humans to Mars, and worked on science policy with President Barack Obama’s science advisor and the National Science and Technology Council. After more than 25 years of experience in the field, Stofan is bringing her passion for science to the Smithsonian. As the National Air and Space Museum embarks on its mission of revitalizing and reimagining the museum, the importance of a strong leader while it undergoes change cannot be overstated. In this moderated discussion with Stofan, she will share her passion for science, insights on leading a national museum, and serving diverse audiences—particularly women and girls—to inspire the next generation of science innovators. This speed-dating session will feature Smithsonian and Affiliate museum educators who have collaborated in a nationwide education program designed to develop new instructional materials and content highlighting Asian Pacific American and Latino experiences within K-12 humanities subject areas. Using the Smithsonian Learning Lab platform, teachers and museum educators are able to create and share locally relevant digital resources both in their classrooms and with a growing network of educators across the country. Learn more about how you can leverage digital museum resources from the Smithsonian and your own museum for increased access, visibility, and impact. In this case study, panelists will explain how the Springfield Museum of Art constructed partnerships in its community and leveraged its relationships with national organizations to bring unique resources to educators. The discussion will focus on how a small museum crafted innovative ways to bring something new to its community, in particular, professional development around serving students with disabilities. The panel will guide participants in thinking through a range of collaborative opportunities to address accessibility in their communities in fresh ways. Lunch is not provided. The L’Enfant Plaza food court is conveniently located one level below the hotel. The Michigan State University Museum chose to react to the horrific sexual abuse committed by a university doctor by documenting, collecting, and creating programming that would honor survivors. This included partnering with the parents of survivors, and facilitating a community curation process with survivors and allies, leading to a collaborative exhibition. This process has been mindful of recognizing when to step back and listen, realizing that the museum’s job was to help create spaces for those most impacted to have a voice. This session will discuss actions, challenges, and rewards of working through a community curation process and of tackling difficult, topical, and highly charged subjects. This session will catalyze collective action by exploring ways that participants can work together to foster conversations around climate change within the philosophy of Earth Optimism. Participants will be invited to respond to challenging questions about climate change, such as what we expect visitors to learn, values and a common language to talk about this issue, involving youth in education and advocacy, and the role of scientists and facts in the discussion. Each panel speaker will focus on a question and share how their organization is tackling it through programming. Participants can expect to leave the session with tested solutions and ideas for addressing climate change in their own communities. How does your organization’s structure and culture support the evolution of your Smithsonian affiliation? An example from The Rockwell Museum demonstrates how it changed its internal structure to better leverage the affiliation. By designing internal communication to support the evolution, The Rockwell Museum maximized their impact and delivered greater value to the communities they serve. Join representatives from The Rockwell Museum and Smithsonian Affiliations for a panel discussion as they share how their model for internal collaboration has activated their Affiliation and increased community engagement. Today, irreplaceable collections and essential records that make up the fabric of our communities face unprecedented hazards. Earthquakes, hurricanes, fires, and other threats render people and their heritage increasingly vulnerable. Cultural heritage is not a renewable commodity; when it is gone, communities lose resources for economic development, tourism, and commerce, as well as our shared identity, knowledge, and creativity. Speakers will explain how the topic of resource development emerged as an important issue following recent disasters and then dive into a hypothetical case study framed around a major disaster. The case study will explore challenges and possibilities for grant professionals and others with grant-writing experience to assist museums that are dealing with a disaster’s aftermath and need temporary assistance in applying for resources. This session will encourage participants to think about their organization’s capacity to deal with a disaster. Led by Smithsonian Affiliations staff. This session aims to help Affiliates understand the benefits of selling Smithsonian memberships as an add-on to their institutional memberships. It will also demystify Reciprocal Membership and encourage new Affiliates to offer this benefit to their members. What are Affiliates and the Smithsonian doing to address climate change? How can we change the conversation from gloom and doom to one about building a community of practice around what is working in conservation? Come share what your organization is doing to address climate change with its visitors, hear from others, and discuss how we can replicate best practices and good ideas. Join Representatives from the Smithsonian’s Digital Program Office for a morning demonstration of an open source 3D viewer and storytelling tool. The digital team will break-down the language (metadata, storage, open source) and share how these tools can be used for free. using the Apollo Command Module as an example, see how these interactives are being used as learning tools for students of all ages and levels. Follow up with the team at the Smithsonian Resource Fair after the demo. Meet with liaisons from Smithsonian museums, programs, and offices, as well as additional special exhibitors. How Can Museums Effectively Respond to Changing Contexts? How can museums, especially community-based museums, use programs, collections, and exhibits to quickly and effectively respond to changes in the community? Using the Arab American National Museum as a case study, hear how they pivot programs and exhibits to more effectively tell their community’s story—a story that changes frequently in a volatile political climate. Participants are invited to brainstorm ways that museums can engage with each other, share resources, and find new pathways to tell stories in a constantly evolving cultural, social, and political landscape. In 2018, The DuSable Museum used a Google grant to fund technology infrastructure improvements, as well as to develop new technology features for the museum’s permanent exhibit, The Harold Washington Story. The most exciting component was a new augmented reality app titled, The Augmented DuSable Museum. The technology merges the ideas of developers, designers, content creators, curators and others, and results in an engaging product that will enhance the museum experience. This session will present the challenges and successes experienced during the planning and implementation of the project, and the ongoing realization of this exciting re-boot at the nation’s oldest independent black history museum. Honoring Traditions/Bridging Generations connected indigenous master and emerging artists and the public. Linked to ASM’s “Save American Treasures” collections, the nine-month program honored six master basket weavers and potters, while building skills in artistry, presentation, and museum education for a cohort of six emerging artist interns. This session shares how a community of engagement can build capacity for all involved. Discussion will continue during a hands-on basket weaving activity. Following a major disaster, survivors often discard damaged personal property, which can include treasured pieces of history and heritage integral to a person’s family and cultural identity. Museums are in a unique position to provide preservation advice and demonstrate material-handling techniques to these disaster survivors within their community. With training, they can help survivors salvage their irreplaceable heirlooms such as photos, books, and artwork, providing hope for recovery. The Smithsonian Cultural Rescue Initiative and FEMA, which launched “Saving Your Family Treasures,” will demonstrate this program’s guidance and seek interested collaborators who wish to implement this type of program at their institution. The Abbe Museum in Bar Harbor, Maine is recognized as a world leader in decolonizing museum practices. As the education and collection teams work tirelessly to be inclusive in the Museum’s spaces and programs, the Abbe has extended the dialogue to include both the Museum’s marketing and philanthropy efforts. In this session, panelists share their evolving experiences with the ways that identity, exclusion, and privilege have shaped museum giving, and the work being done to engage new audiences and rethink traditional beliefs around wealth and philanthropy. How do we adjust our marketing and development language to reflect this necessary shift? Come to this session prepared to learn and participate in a dialogue, as it will be a moderated town-hall format. Meet Shuttles for Smithsonian Exhibits and Museum Support Center workshops. Shuttles depart at 9:00 a.m. In this workshop-tour, participants will go behind-the-scenes in the Department of Anthropology collections and the National Anthropological Archives. Throughout the tour, participants will be introduced to a number of ongoing collaborative projects that aim to reach under-served communities using these collections. In the workshop, participants will be asked to brainstorm: How can we creatively think about broadening the definition of ‘access’ to our collections and rethink what ‘impact’ looks like beyond social media engagement and public program attendance? What communities do our institutions need to serve better? How do objects and archival collections/staff play a role? An exhibit’s “big idea” is what focuses your exhibition. The “hook” is that funny, interesting, or poignant element that visitors connect to. This participatory workshop includes a behind-the-scenes tour of the Smithsonian Exhibits facility and will help focus your exhibit ideas and find a hook to engage visitors. The first half of the workshop will focus on a hypothetical exhibit and address key messaging, critical questions to ask, and discover your “hook.” The second half will apply the same exercise to actual exhibits the participants are planning. Participants will pair up and share their experiences with the wider group and leave the session with copies of Smithsonian Exhibit’s Guide to Exhibit Development. Participants should attend the workshop with an exhibit idea to work on. This session will use the landmark exhibition, Girlhood (It’s Complicated) to explore current conversations women’s history and how they can resonate locally. Maximizing Your Exhibit Investment: Recycle that Great Content! Creating exhibits can be a costly enterprise and often for a limited timeframe. Explore ways to maximize the impact of your large or small exhibit beyond its original scope. Think long-term about investing in your exhibitions to develop traveling versions that can both extend an exhibition’s life and provide access to content in underserved communities. Hear how this idea began as an experiment to have great content recycled instead of destroyed, and how its reception in the museum and around the state ultimately exceeded expectations. Participants will hear unexpected lessons learned and creative content adaptions all kinds of spaces and budgets. Participants will be encouraged to share their own experiences, and to break out into groups to troubleshoot each other’s projects. The Preparedness and Response in Collections Emergencies (PRICE) team serves as the Smithsonian’s collections emergency support team. When activated in an emergency, PRICE provides collections support, response, and recovery. Attendees will learn about the training opportunities that have been developed and implemented at the Smithsonian and share ideas and lessons learned before delving in to a hands-on workshop. Attendees will then practice handling techniques for various collections materials in ideal (dry) and non-ideal (wet) conditions. Participants will take away best practices and learn resources available to them in times of an emergency. This special session will include representatives from IMLS, NEH, NEA, AAM and more. Learn about new funding opportunities; learn about AAM’s 5 Core Documents, and have face-to-face time with the agencies that advocate for museums every day.